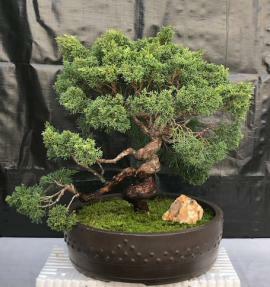 The Japanese Shimpaku Juniper is a needled dioecious evergreen meaning there are separate male and female plants. Shimpaku is a naturally irregular vase shaped Juniper and this specific tree has been trained to have a coiled trunk and coiled branches. 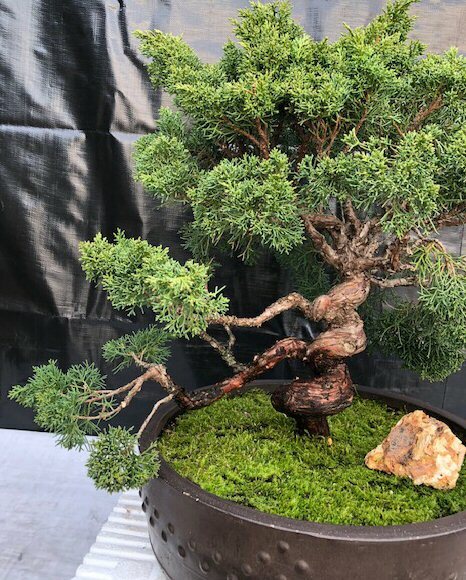 The Shimpaku has attractive year round foliage and its dark green needles are soft to the touch. Very popular and easy to care for bonsai. 55 years old, 16" x 14" x 18" tall. Outdoor evergreen Bonsai tree, grown and trained by Bonsai Boy. Potted in a 13" brown oval unglazed ceramic container. Suitable humidity/drip tray is recommended. To purchase add $16.95.